Scott Edgar, Simon Hall and Steven Gates – together better known as Tripod – have been stalwarts of the Aussie comedy scene for well over a decade now. It’s been three years since the band’s last DVD and this latest release does indeed, as the marketing material would have it, find the lads in fine fettle. Their 75-minute concert from last year’s Woodford Folk Festival is included in its entirety, and incorporates such fan favourites as ‘Hot Girl in the Comic Shop’ as well as several newer compositions that certainly hold their own against the more established material. Thankfully Scod, Yon and Gatesy haven’t mellowed with the onset of marriage and fatherhood. These rather adult endeavours are largely eschewed as subject matter in favour of typically acerbic and self-deprecating odes to Dungeons and Dragons, air guitar and the perils of getting stuck behind tall people in a mosh pit. The Tripod sense of the absurd also features prominently, even when matters threaten to take a serious turn. ‘Trees’, introduced as a song about the environment, is quickly revealed to instead be a riff on the injustice of trees occasionally being forced to become chained to hippies, and the first-person ‘Suicide Bomber’ contains whistling, a jaunty falsetto and brilliantly flip references to the unsightliness of blind aherance to right-wing political ideologies. There are no pyrotechnics, fancy lighting effects or other audiovisual bombast a la Tim Minchin, and truth be told the trio probably don’t have the inclination (or the ability in their unrepentant average-bloke nerdiness) to pull off such spectacle. Instead Live at Woodford captures Tripod doing what they do best; performing their catchy and cleverly composed satirical musings in front of a rapt audience, with a minimum of fuss and some damn fine fretwork. 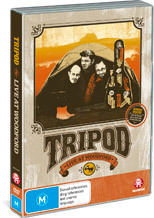 Having undoubtedly earned their self-proclaimed title of ‘Australia’s premiere stadium vaudeville manband’, this latest DVD release finds Tripod at the top of their game. Recent shows have been garnering rave reviews both at home and abroad, with even the usually hard to impress Scotsman declaring the guys ‘one of the funniest things happening in the world right now’. Live at Woodford features enough new material to satisfy long time fans of the three-piece, while the strength of the material should impress newcomers and those whose familiarity mainly extends to the band’s numerous radio and TV appearances in Australia. Also included as a generously substantial bonus feature is their entire set from the 2007 Melbourne International Comedy Festival, entitled ‘How to Train an Attack Dog from Scratch (A Made-Up History of the Funny Song)’. Superb stuff.